Ahead of their British Psychological Society seminar series, Line Caes and Abbie Jordan call for creativity in research design. Living with chronic health conditions during adolescence can bring particular psychological and social challenges. But do we need to make more effort to hear the voices of those affected? Being an adolescent is not easy. We’ve all experienced those simultaneous and rapid changes in physical, cognitive, emotional and social functioning. Adolescents strive for acceptance by peers; they desire to be independent. Now imagine tackling these challenges while also living with chronic illness.Department of Health figures suggest that over 15 million people in the UK experience an ongoing health condition. Recent research by Claire and colleagues suggests poor outcomes for young people with ongoing health conditions (Lemer et al., 2014); it’s vital, then, that we gain understanding of how health conditions can negatively impact quality of life at this stage. But are the tools we are using up to the job? According to research led by Gus Baker at Liverpool, the diagnosis of epilepsy has been found to inhibit adolescent engagement in many activities, such as attending school, extracurricular programmes, sports, certain practical subjects and school trips. This reduced engagement for young people can severely compromise the development of autonomy and independence, relationships with peers, and social competence. Similarly, a 1991 study led by Robert Blum in adolescents with spina bifida and cerebral palsy found that whilst friendships were rated as very important, opportunities for contact outside school, engagement with organised social activities and dating were limited. Furthermore, activities with friends were mostly sedentary. Blum also looked at the importance of parental behaviours in understanding the social context of young people with chronic health conditions. While the majority of youth with a chronic illness report a good relationship with their parents, a common observation amongst this youth group is parental overprotection. For instance, parents might exclude their child from social activities. Despite being well intentioned, this could be detrimental for the child’s social competence by limiting opportunities for developing and refining key social skills, such as building independence and relations with peers (see Miya Asato’s research on adolescent experiences with epilepsy). A common feature of many chronic illnesses in youth (e.g. sickle-cell disease, arthritis and inflammatory bowel disease) is the experience of pain (see a 2014 review for the Cochrane Library by Chris Eccleston’s group at Bath). This could clearly exacerbate the impact of such illnesses on social development, but in fact this experience of persistent pain can be a chronic illness in its own right. A 2011 systematic review for the journal Pain, led by Sara King, revealed that chronic or ongoing pain (regardless of aetiology) affects up to 30 per cent of adolescents, with 5–8 per cent experiencing disabling pain. While evidence in this sample is limited, Paula Forgeron’s research study published in 2010 suggests that disruptions to peer relations, friendships and social engagement are common amongst youth with ongoing pain. This is nicely illustrated in the drawing opposite made by a young person with chronic pain when asked to reflect how pain impacts on her daily life. It’s a double whammy: not only is there a detrimental impact on the youth’s social development, as strong peer relationships are necessary for healthy adolescent development, but they also miss out on the beneficial role of such support in coping with ongoing pain (e.g. via adaptive emotional adjustment and positive social comparisons, as highlighted by Eccleston’s group in a 2008 study for the European Journal of Pain). Is there more going on here than limited opportunities? Reduced social competencies might play a role. To our knowledge, only two studies have investigated social competencies amongst youth with ongoing pain, with findings revealing delayed social development. For example, amongst Eccleston’s 2008 clinical sample of 110 youth with chronic pain attending an inpatient multidisciplinary treatment programme, about half reported ‘feeling behind’ in various aspects of psychosocial development (e.g. dating, social acceptance, social confidence). This perception of being socially delayed was confirmed in our large community sample of 856 youth with ongoing pain (Caes et al., 2015). This study also revealed more nuance in this social impairment: girls with particularly high levels of anxiety concerning their pain also report feelings of being behind in their psychosocial development. Yet despite the overwhelming evidence across various chronic illnesses revealing difficulties with engaging in everyday adolescent normative activities, little is known about the exact social challenges that young people with ongoing pain experience. Predominantly, research into young people’s pain has focused on the use of methods such as questionnaires, experimental methods, observational studies and interviews. Through a variety of typically offline media, these methods elicit information from young people concerning their experiences, behaviours, perceptions or functioning in relation to living with ongoing pain. Whilst existing research has valuably extended knowledge about the social challenges faced by young people who experience pain, it faces a number of methodological challenges; in particular, a lack of focus on studying online environments occupied by young people with ongoing pain and a lack of active engagement with young people in the research process. Whilst ‘offline’ methods generate important knowledge, they do not provide an accurate reflection of the ways and environments in which young people are communicating in daily life. It is well recognised that as a group, adolescents are heavy users of online technology, with the development of smartphones allowing around a quarter of adolescents to be online ‘almost constantly’ (according to the Pew Research Center in 2015). Notably, young people are highly competent and proficient users of social media technologies such as Instagram, Twitter and Facebook, using these media to create, edit, share and discuss material. Research examining the social challenges faced by young people with ongoing pain has not addressed this rich source of information on the online environments that young people situate themselves within. This mismatch between methods used to study social functioning and the online environments inhabited by young people is exacerbated when we acknowledge that the young people that we are studying typically have reduced face-to-face contact with peers due to their pain experiences (Fales & Forgeron, 2014). As such, the population being studied might have an even heavier online presence than that of ‘healthy’ adolescents. Studies in the wider paediatric literature have highlighted the acceptability of online-based research methods with young people in different formats, including those of asynchronous focus groups (e.g. Boateng and others published a study last year, with adolescents who had received heart transplants) and online interviews conducted remotely via Skype (e.g. listen to a podcast about the 2016 study from Susie Weller). With this in mind, we argue that research exploring the social challenges faced by young people with ongoing needs should adopt a more diverse approach to conducting research in both online and offline environments. A second, potentially related, problem concerns the lack of active engagement with young people in the research process. With the possible exception of unstructured or semi-structured interviews, methods such as questionnaires and observational studies typically involve the researcher actively eliciting information from the young person as the research participant. Isn’t there an opportunity for young people to take a more active and creative process in engaging with the direction and outputs of research? How much more rewarding would it be for young people, ensuring that their voices are heard and different types of research questions can be addressed. For example, as far back as 1997 story completion techniques were successfully used by Susan Moore’s team to explore adolescent perceptions of risk taking and enable adolescents to ‘project’ themselves into risky situations through generation of their own stories from a sample story stem. According to Virginia Braun and Victoria Clarke’s 2013 book Successful Qualitative Research, story completion techniques can help to answer research questions that focus on exploring assumptions and perceptions of a phenomenon. Such techniques may lend themselves well to examining not only how young people who experience ongoing pain are perceived by others, but also how these young people perceive their future. Research methods that place an increased focus on the participatory role of the young person in the research process, such as arts-based methods, may also provide an important opportunity to empower young people with ongoing pain and ensure that their voices are heard. For example, Carter and Ford (2013) provide a useful overview of the value of using photos and drawings alongside more traditional methods of interview- and questionnaire-based research to examine health issues in children. Looking at more recent literature, Vindrola-Padros led a consideration of how a variety of creative methods can be used to study health issues in adolescents with long-term health conditions, noting some recommendations for good practice. Interestingly, the authors conclude that what is important for conducting research with young people with health conditions is a need to use a variety of research methods to encourage creativity, flexibility and engagement of young people in the research process. We agree, and argue that there is a need to use a more diverse range of methods with young people who experience ongoing pain, along with more traditional methods, to explore the social challenges that these individuals face. The implementation of these various techniques would also need to acknowledge a more creative approach towards ‘where’ young people engage with these methods with regard to offline or online spaces. We firmly believe that in order to increase our knowledge concerning the specific social challenges faced by adolescents with ongoing pain, the chosen research designs must match both the communication media and styles of this particular group, and facilitate adolescent engagement. With this in mind we successfully gained funding from the British Psychological Society to host a series of seminars, including a one-day seminar based at the University of Stirling (3 March 2017) and a subsequent two-day seminar event based at the University of Bath (19–20 April 2017). These seminars are free to attend and each will bring together researchers, clinicians and young people with an interest in social challenges faced by adolescents with ongoing pain and/or expertise in using varied assessment techniques. More information about the seminar series can be found for the Stirling event and Bath. If you felt enthused or intrigued by the discussion in this article, we encourage you to attend one or both of these seminars to join us in discussion around more creative designs for use with young people. Picture above by 'Hannah', aged 12, used with kind permission. Asato, M.R., Manjunath, R., Sheth, R.D., et al. (2009). Adolescent and caregiver experiences with epilepsy. Journal of Child Neurology, 24(5), 562–571. Baker. G.A., Spector, S., McGrath, Y. & Soteriou, H. (2005). Impact of epilepsy in adolescence: A UK controlled study. Epilepsy & Behavior, 6(4), 556-562. Blum, R.W., Resnick, M.D., Nelson, R. & St Germaine, A. (1991). Family and peer issues among adolescents with spina bifida and cerebral palsy. Pediatrics, 88(2), 280–285. Boateng, B., Nelson, M.K., Huett, A. et al. (2016). Online focus groups with parents and adolescents with heart transplants: Challenges and opportunities. Pediatric Nursing, 42(3); 120-123. Braun, V. & Clarke, V. (2013). Successful qualitative research: A practical guide for beginners. London: Sage. Caes, L., Fisher, E., Tobias, J.H. & Eccleston, C. (2015). The role of pain-related anxiety in adolescents’ disability and social impairment: The ALSPAC data. European Journal of Pain, 19, 842–851. Carter, B. & Ford, K. (2013). Researching children’s health experiences: The place for participatory, child-centered arts-based approaches. Research in Nursing and Health, 36(1), 95–107. Department of Health (2012). Report: Long-term conditions compendium of information (3rd edn). Eccleston, C., Wastell, S., Crombez, G. & Jordan, A. (2008). Adolescent social development and chronic pain. European Journal of Pain, 12(6), 765–774. Eccleston, C., Palermo, T. M., Williams, A.C.D.C. et al. (2014). Psychological therapies for the management of chronic and recurrent pain in children and adolescents. Cochrane Review, 5, CD003968. Fales, J. & Forgeron, P. (2014). The importance of friendships in youth with chronic pain: The next critical wave of research. Pediatric Pain Letter, 16(3), 35–39. Forgeron, P.A., Chorney, J.M., Carlson, T.E. et al. (2015). To befriend or not: Naturally developing friendships amongst a clinical group of adolescents with chronic pain. Pain Management Nursing, 16(5), 721–732. Forgeron, P.A., King, S., Stinson, J.N. et al. (2010). Social functioning and peer relationships in children and adolescents with chronic pain: A systematic review. Pain Research and Management, 15(1), 27–41. Gebauer-Bukurov, K., Markovic, J., Sekulic, S. & Bozic, K. (2015). Social competence among well-functioning adolescents with epilepsy. Epilepsy & Behavior, 42, 54–60. King, S., Chambers, C.T., Huguet, A. et al. (2011). The epidemiology of chronic pain in children and adolescents revisited: A systematic review. Pain, 152, 2729–2738. Lach, L.M., Ronen, G.M., Rosenbaum, P.L. et al. (2006). Health-related quality of life in youth with epilepsy: Theoretical model for clinicians and researchers. Part I: The role of epilepsy and co-morbidity. Quality of Life Research, 15(7), 1161–1171. Lemer, C., Cheung, R. & Davies, S. (2014). Research to improve outcomes for children and young people with long-term conditions. Archives Diseases of Childhood, 99, 303–304. Moore, S.M., Gullone, E. & Kostanski, M. (1997). An examination of adolescent risk-taking using a story completion task. Journal of Adolescence, 20(4), 369–379. Ofcom (2015). Children and parents: Media use and attitudes report. Olsson, C.A., Bond, L., Johnson, M.W. et al. (2003). Adolescent chronic illness: A qualitative study of psychosocial adjustment. Annals of the Academy of Medicine, Singapore 32(1), 43–50. Perquin, C.W., Hunfeld, J.A.M., Hazebroek-Kampschreur, A.A.J.M. et al. (2003). The natural course of chronic benign pain in childhood and adolescence: A two-year population-based follow-up study. European Journal of Pain, 7, 551–559. Pew Research Center (2015). Teens, social media and technology overview 2015. www.pewinternet.org/2015/04/09/teens-social-media-technology-2015 (Accessed 17 November 2016). Vindrola-Padros, C., Martins, A., Coyne, I. et al. (2016). 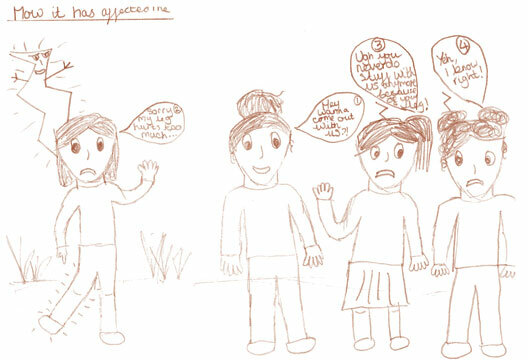 From informed consent to dissemination: Using participatory visual methods with young people with long-term conditions at different stages of research. Global Public Health, 11, 5–6, 636–650. Viner, R. & Christies, D. (2005). ABC of adolescence: Adolescent development. British Medical Journal, 330(7486), 301–304. Wong, C.A., Merchant, R.M. & Moreno, M.A. (2014). Using social media to engage adolescents and young adults with their health. Healthcare, 2(4), 220–224.